This recipe was originally created for my daughter's Girl Scout camping trip and featured in Just Like Magic in my occasional blog Random Acts of Deliciousness. Girl Scout Summer Harvest Soup made in the Adventure Kitchen. 1. Put the chickpeas in a large pot with 8 cups of cold water. Cut one of the onions into large chunks and add them to the pot. Stir in 2 Tablespoons coarse salt and bring to a boil over high heat with the lid on. When it begins to boil (you'll see steam), put the lid askew and turn heat to medium or medium-low to maintain a gentle simmer. Cook for about 2 hours, until the chickpeas are quite tender. 2. Strain the chickpeas and onion pieces (leave the remaining onion pieces in; they will fall apart and add flavor to the final dish). Measure the broth and add enough cold water to bring the total broth volume to 5 cups. 3. Dice the second onion into 1/4-inch pieces. Wipe out the pot and warm the olive oil in it over medium heat. Add the celery and onions and cook gently for about 15-20 minutes, until they are very soft. Adjust the heat as needed to prevent them from browning much. 4. Add the garlic to the pan and stir just until fragrant. Pour all but 1 cup of broth into the pan and bring to a simmer with the lid askew. When bubbling, add the carrots and simmer for 10 minutes, until soft enough to be pierced with a fork. 5. As the carrots cook, whisk the masa harina into the final cup of broth. When the carrots are ready, add the masa-broth mixture to the pot, along with the chickpeas, and return the pot to a simmer, stirring occasionally. 6. Ten minutes before serving, add the Swiss chard to the pot and simmer for about 5 minutes with the lid askew, stirring occasionally until tender. Stir the thyme, parsley and zucchini into the soup, put the lid askew and simmer for another 5 minutes or so, until the zucchini pieces can be pierced with a fork. 7. Stir, scraping the bottom of the pot to prevent the masa from sticking. If the soup seems too thick, stir in another cup or so of cold water. Remove from heat and stir in the lemon juice. Taste. Add pepper, more water or salt if needed. 8. Serve, topping each bowl with the cheese and basil. Please note that as in all my recipes, I'm calling for coarse salt here (specifically, I use Diamond Kosher Salt). I mention this only because if you are using regular table salt, you'll need to use much less (about one-third to one-half the amount called for). This whole recipe hinges on that amazing, flavorful chickpea broth, so you'll want to salt it correctly. If for some reason, despite our best efforts, your soup is too salty in the end, you can dilute it with water before serving until you are happy with the results. Feel free to soak your chickpeas ahead of time if you want to. FYI: I never do. It's an extra step I am never organized enough ahead of time to take, and I find it completely unnecessary anyway. J. Kenji Lopez-Alt, food science writer extrodinaire, agrees with me. The one benefit of soaking is that cooking time is reduced. But on the other hand, you just spent all that time soaking, so I'm not sure you've actually saved any time in the end. Still, if you like to soak your beans for any reason, go right ahead, and cut chickpea cooking time by about half. 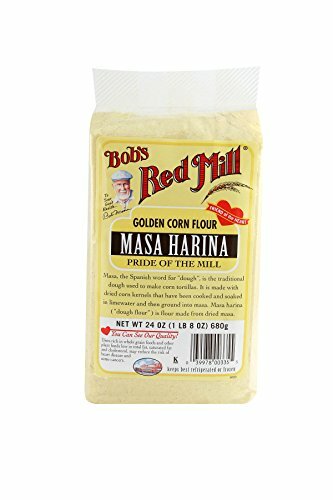 Masa harina is nixtamalized ground dried corn, often used to make tortillas. In this recipe, it's here as a thickening agent for the broth. This idea came from my friend Meredith, a local Girl Scout troop leader and culinary-school trained chef. This recipe was originally created to be served in a soup bowl, and thickening the broth is key so that it doesn't immediately soak through. The masa harina also lends the soup a really nice, subtle corn flavor, and provides essential amino acids which, in combination with the chickpeas, make for a complete protein. (Also, I loved the idea that a soup created for Girl Scouts pays homage to the foods of native people.) I'm including a link to masa harina on Amazon in case you can't find it locally. The easiest thing to do is to just leave the broth brothy, rather than thickening it. It will still be really delicious. Another option is to blend about 1/4 to 1/3 of the chickpeas (in a blender, or with an immersion blender) into a thick paste, then add this along with the rest of the whole chickpeas. A third option is to sprinkle 1-2 Tablespoons of flour over the onions, celery and garlic, stirring to combine, until if forms a loose paste (roux). Then pour in the broth and bring it to a boil, and the broth will thicken. Finally, you could use a little arrowroot or cornstarch in place of the masa harina called for. Just whisk it into a portion of the broth as written in the recipe. I haven't personally thickened a soup this way, but I'd start with about a Tablespoon whisked into a cup of broth, then add more if needed. You can make most of this recipe ahead, then finish it in about 30 minutes. You could cook the chickpeas ahead of course, and store them with their liquid in the refrigerator for up to 3 days (or in the freezer for weeks or months). Then, you could strain the chickpea liquid and make the soup through Step 5 on another day. When you're ready to serve, just heat the soup and add the rest of the ingredients according to the recipe. Of course, this recipe is dairy-free and vegan if you eliminate the shredded cheese at the end. (But the cheese is really delicious, so don't skip it if you don't need to).